As the renewable fuel industry advances technology, the changes in federal policy will help move the U.S. closer to energy independence. Ever since the oil embargo of 1973, demand for a workable national energy policy has continued to grow. Over the past 40 years, a variety of strategies have been molded and shaped an attempt to move the United States closer to energy independence. 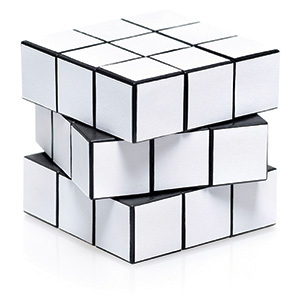 But like a Rubik’s Cube, every turn or twist has brought new ramifications and finding a solution to satisfy all has remained a challenge. The oil embargo awakened the U.S. to the geopolitical vulnerabilities and economic risks that come with dependence on foreign oil. Following the crisis, policymakers scrambled to bring about firmer ground for the nation’s energy security. Such steps included the formation of the Strategic Petroleum Reserve, attempts at increased domestic production and energy conservation measures. But evolving energy policy also brought about a demand for energy diversification, including incentives for domestically-produced, environmentally-friendly, renewable biofuels. The Renewable Fuel Standard (RFS) first came into play with the Energy Policy Act of 2005, and was later extended and expanded with the Energy Independence and Security Act of 2007 (EISA). The RFS is administered by the U.S. Environmental Protection Agency (EPA) and requires renewable fuel to be blended into transportation fuels by growing amounts each year, culminating at 36 billion gallons by 2022. 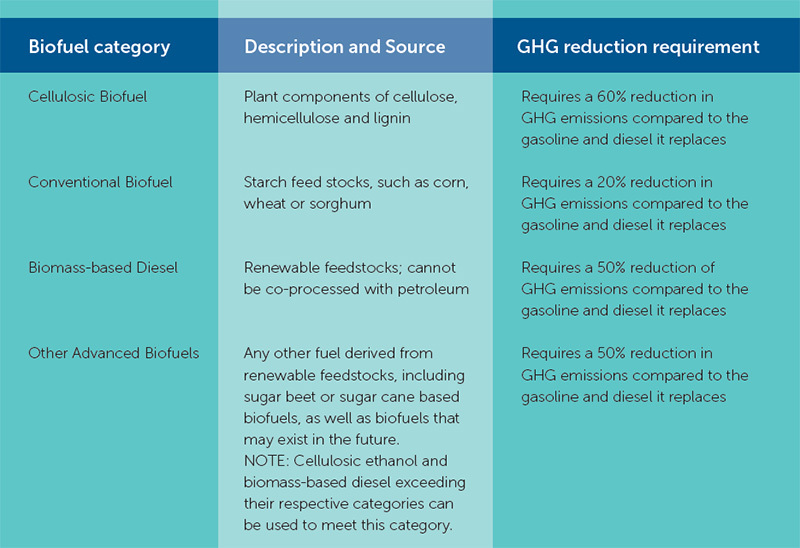 Cellulosic ethanol, like what will be produced by POET-DSM Advanced Biofuels’s Project LIBERTY, is one of four renewable fuel categories recognized by the RFS, as outlined in the chart below. Each fuel must emit lower levels of greenhouse gases (GHG Reduction Requirement) relative to the petroleum products it displaces. This renewable fuel policy, coupled with private investment, has enabled the ethanol industry to develop new technologies and grow their current infrastructure. POET-DSM’s Project LIBERTY, a cellulosic ethanol facility in Emmetsburg, Iowa, is symbolic of the latest advances toward an energy security solution. Commercial-scale production of cellulosic ethanol has long been anticipated by clean energy advocates. “Without a strong RFS to give the private equity community certainty, nobody would be willing to lend us the capital needed to finance these massive advanced biofuels projects,” says Rob Walther, POET’s Director of Federal Affairs. While the RFS is helping the development of cellulosic ethanol, there is concern about the strength of those opposed to the industry and the impact on continued investment. The RFS calls for more cellulosic ethanol and other biofuels which will eventually replace more and more petroleum products every year. As this happens, the political battle will intensify. “That’s what the fight is about: homegrown, clean, domestic energy and getting more of that product into the marketplace versus keeping the country dependent on high-carbon, polluting fossil fuels from countries that are unstable,” Gilley says. The battle with Big Oil interests is nothing new. It has been around since the start of the grainbased ethanol industry. Even with a sound strategy, going up against the force of Big Oil is an immense undertaking. Which is why Gilley focuses his team on elected officials and regulators. But the ethanol industry is prepared for the fight. This isn’t the first time Big Oil has fought back. A strong and competitive grain-ethanol industry exists today which Walther credits to changes in federal energy policy. Like it did with grain-based ethanol, Gilley says the RFS policy successfully created a period for perfecting cellulose technology. It allowed time and funds to lay the groundwork to move from a lab setting, to commercial-scale production, to scaling up across the country. In the not-so-distant future, the marketplace, not the policy, will dictate greater biofuel use. The ethanol industry, auto companies and local retailers are making strides to grow infrastructure with flex fuel vehicles, flex pumps and the biggest advancement, the acceptance of mid-level blends. In January 2014, Tennesee-based convenience store operator MAPCO Express, Inc. announced it would begin offering E15 at new sites as well as select existing MAPCO megastores. As consumers are offered a lower-cost, renewable option, the demand will only continue to grow. Not solely for consumers, all major retailers will need to take a serious look at E15 as well in order to remain competitive.